The Latcham Gallery is excited to present Anatomical Remix, a solo exhibition by Ottawa based Cindy Stelmackowich, January 28 – March 4, 2017 with an opening reception and artist talk on Saturday 28 from 1-3pm. 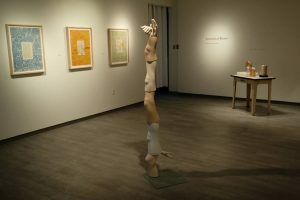 Treading a line between the abject and the purely delightful, Cindy Stelmackowich brings to the Latcham Gallery a series of recently created sculptural works that incorporate dismembered mannequin limbs whose muscle, tendon and tissue are made from the rolled pages of old books. The effect is mesmerizing as one is repelled and compelled by the work at the same time. On the one hand we are confronted with sculptural renderings of cross-sections of body parts which generate a healthy dose of “ick factor” but on the other hand we are drawn in by the sheer beauty and artistry of Stelmackowich’s gently curling pink, red and burgundy pages that make up the muscles of these limbs. The specimens – as that is how they are presented – are arrayed casually around the Gallery and displayed on vintage medical gurneys and stands that suggest they are objects of study. Anatomical Remix is an exhibition not to be missed. The subject might be thought of as clinical or macabre but Stelmackowich crafts artworks that ooze with beauty and thoughtful craftsmanship. She presents sculptures and wall works that will surprise and delight you while at the same time might just give you goose bumps. Anatomical Remix runs from January 28 to March 4, 2017. We will host an opening reception at 1 pm at the Gallery on Saturday January 28. It is a great opportunity to meet the artist and everyone is always welcome. The Artist wishes to thank the Ontario Arts Council and the City of Ottawa for their financial assistance in the creation of this work. 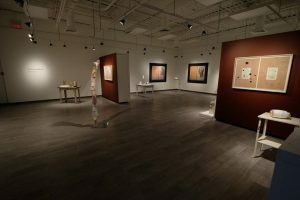 The Latcham Gallery is a public art gallery dedicated to exhibiting contemporary art. The Gallery is located on the Main Street in Stouffville, 45 minutes north-east of Toronto, Ontario. My art practice has centered on long-standing interests related to the human body as a site of fragility, mortality, beauty and memory. Of specific interest to me is how our bodies have, and continue to be, subjected to the regimes of medical practice, knowledge and preservation.